A graduate of Lyon's College of Fashion Design (SupdeMod), Catherine Osti began her career in Chanel's famous tailoring workshops in Paris, where she worked for six years on Haute Couture collections. Catherine then set up her own company and worked with an array of designers (Alexis Mabille, Sébastien Blondin, ...) while still collaborating with Chanel for Haute Couture shows. Having accumulated a wealth of experience, she launched her own brand based on a simple concept: to create a fashion accessory that goes with all outfits and enhances any silhouette. This is what she achieved when she created an exclusive collection of Jewellery Cuffs, a concept in which shirt cuffs are given a high-class designer twist and embellished with jewels, lace, braids and more. Subtle expressions of French lifestyle, the jewellery cuffs of Catherine Osti are completely made in France, from design to manufacture. 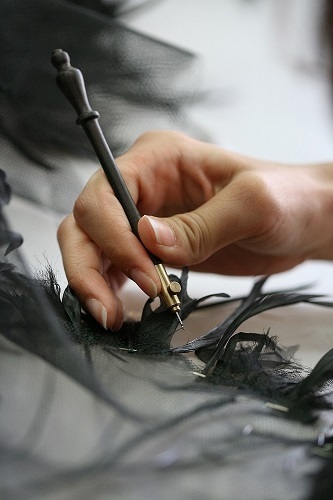 Located in Lyon and comprising seamstresses having broke with the requirements of the Haute Couture Fashion Houses, Catherine Osti's fashion house strives to continue French expertise, notably thanks to its collaboration with the Métiers d'Art (luxury artisanal craftsmanship). Through her creations, Catherine Osti offers delicate alchemy between the sophistication of materials and exceptional artisanal production to wonderfully revisit the spirit of luxury and French elegance. 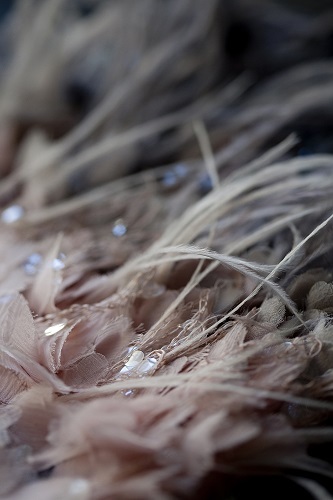 Convinced that the poetic scope of a creation rests in part on an exceptional expertise, Catherine Osti has created close ties with the Métiers d'Art (luxury artisanal craftsmanship), through its various professions such as embroiderers, pleat makers and plumassiers. These collaborations with Luxury Fashion Houses grant a unique character to the cuffs of the ''Couture'' collection and allow people to have Haute Couture at arm's reach.